Now available from the online store for only £8.99. 1971 was the year Dina Glouberman went mad. Now, for the first time, she writes with candour and distinctive dark humour about her spell in a psychiatric ward which proved to be a catalyst for the powerfully creative life that led to the launch of Skyros Holidays, the globally iconic pioneer of alternative holidays. In this remarkable memoir, psychotherapist Dina Glouberman opens up about her journey into madness which resulted in her hospitalisation. She describes her profound experiences in a Middlesex Hospital psychiatric ward with great honesty, describing hair-raising moments – including finding herself on the roof of the hospital, convinced she was an FBI target – as well as the key role the community of patients had in pulling her back from madness. Into the Woods and Out Again is far more than an intimate story about an episode of madness; it is also a window into the dramatic world of therapy and analysis in the 1960s. With vivid insight and professional wisdom, she reflects also on marriage, mothering, birth, death, imagination, aloneness, and spirituality. Significantly, she focuses on her growing sense of the importance of community, which became the foundation for the Skyros Holidays. Eight years after leaving the Middlesex Hospital, Dina and her Greek husband, Yannis, travelled from her house in London, with a new born baby in arms, to an abandoned school on the island of Skyros in Greece. Literally living under the stars, they fixed the derelict building in time for 15 guests to arrive to give birth to a community like no other. It is 2018, and Skyros Holidays are set to celebrate their 40th anniversary. Dina has taken time to reflect upon her own life, writing Into the Woods and Out Again: A Memoir of Love, Madness and Transformation. It gives an amazing look not only at the years of madness but at the twelve years of explosive creativity when she launched her business, had two babies, pioneered her transformational Imagework approach to therapy and personal development, had a life-changing spiritual experience, faced the loss of her father and brother, and wrote her first book. Into the Woods and Out Again is an inspiring memoir that – with honesty and down-to-earth humour – invokes the essence of a remarkable time and place by a woman who dared to make her dreams a reality. 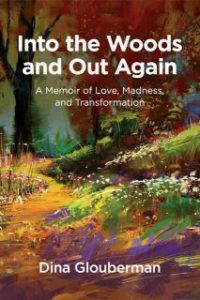 Into the Woods and Out Again: A Memoir of Love, Madness and Transformation by Dina Glouberman, published by Sphinx, is now available from the online store for £8.99.